For employers, managing payroll smoothly and properly is a delicate, critical matter. There may be no quicker way to turn a happy employee into a disgruntled one than by mishandling his or her paycheck. This year, employers have an additional challenge to contend with in this area. When Congress passed and the President signed into law the Tax Cuts and Jobs Act (TCJA) late last year, it meant the IRS withholding tables would have to be updated. And now they have been. As you’re no doubt aware, the withholding tables enable employers (or their payroll services) to determine the amount to withhold from employees’ paychecks in light of their wages, marital status and number of withholding allowances. The revised tables reflect the TCJA’s increase to the standard deduction, suspension of personal exemptions, and changes in tax rates and brackets. The new withholding tables are also designed to work with the Forms W-4 that employers already have on file for their employees. In other words, your employees don’t need to complete any new forms or take any other action now. As you adopt the new withholding tables, it’s a good idea to also communicate the changes and their implications to your employees. The IRS expects that many working taxpayers will see increases in their paychecks after the new tables are instituted in February. But it’s possible that some of your employees could find themselves unexpectedly hit with bigger income tax bills when it comes time to file their 2018 tax returns. This is because the TCJA eliminates or restricts many popular tax breaks a lot of taxpayers have claimed on their returns in past years. In some cases, lower rates and a higher standard deduction won’t make up for the diminished breaks. Make sure your employees are aware that it’s their responsibility to alert you, their employer, of any adjustments they’d like to make to avoid under- or overwitholding of taxes from their paychecks. 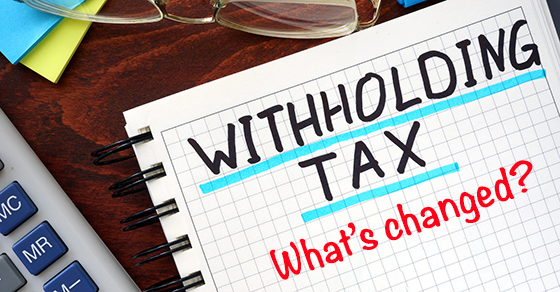 You might point out that the IRS is updating its withholding calculator (available at irs.gov) to assist taxpayers in reviewing their situations. The agency expects the new calculator to be available by the end of February and reflect changes in available itemized deductions, as well as several other important tax-related points. Getting payroll right matters — significantly. Although the TCJA brought some potentially beneficial tax-saving opportunities for employers, it also ushered in some challenges. Please contact our firm for more information. © 2019 Funk Rockwell, PLLC All Rights Reserved.